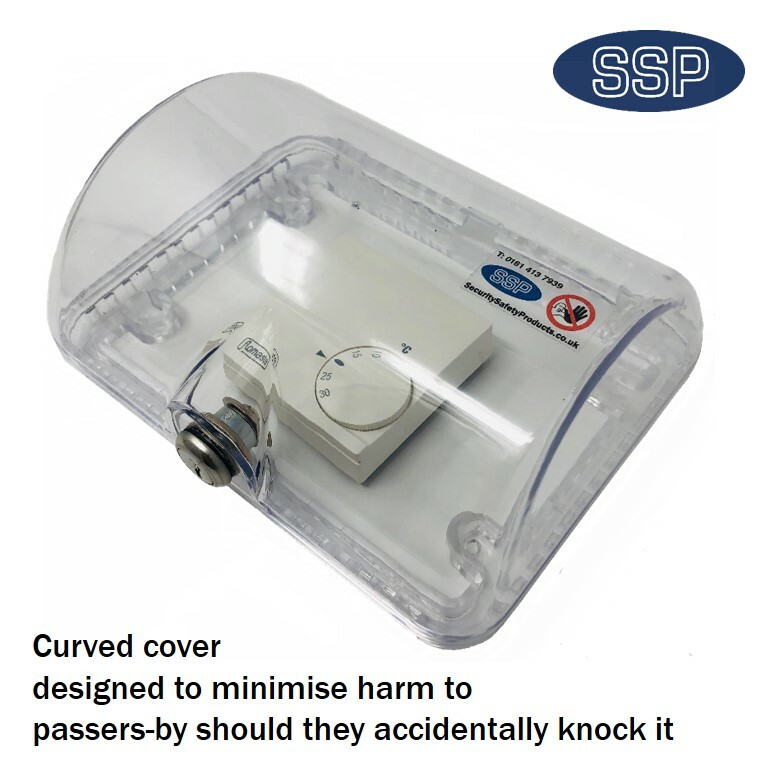 This best selling cover is designed to prevent tampering, conserve energy, reduce heating bills and ultimately save you money. Every one degree a thermostat is turned up by is proven to cost businesses between £30 and £80 a year. To combat this, by spending around £20 on a ThermoSTOP, you could save £100s if not £1000s every year. 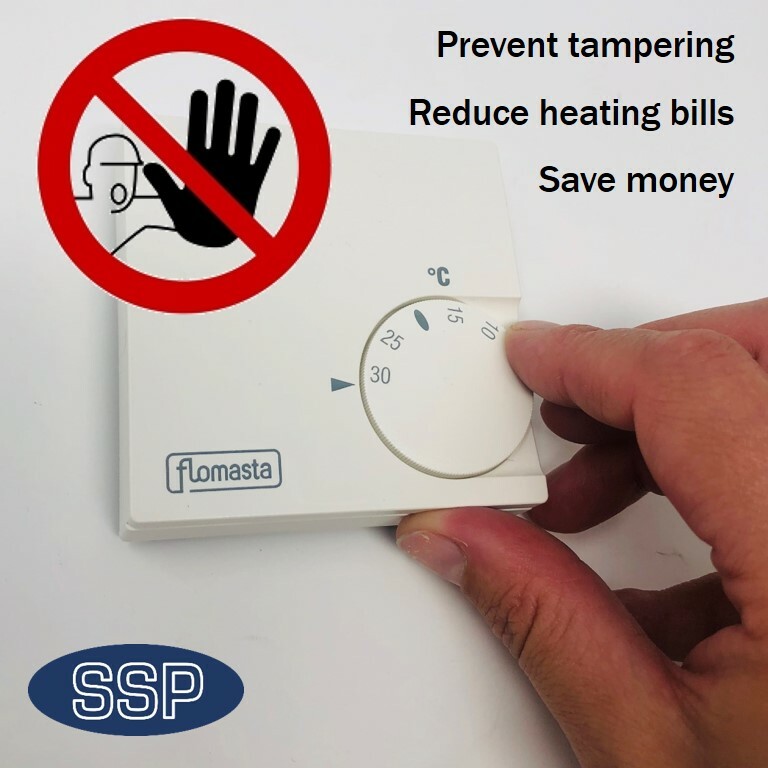 This best selling ThermoSTOP thermostat cover is tough, robust and lockable. 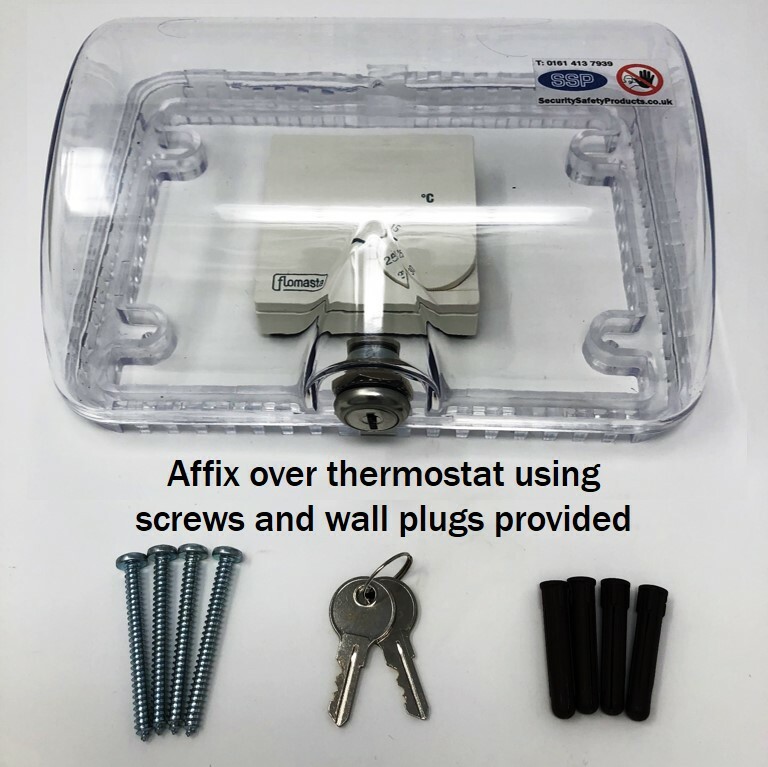 Injection moulded using clear, heavy duty polycarbonate material, the ThermoSTOP cover is designed to fit over the top of wall thermostats, controllers, energy sensors and electrical sockets to prevent tampering, damage and vandalism. 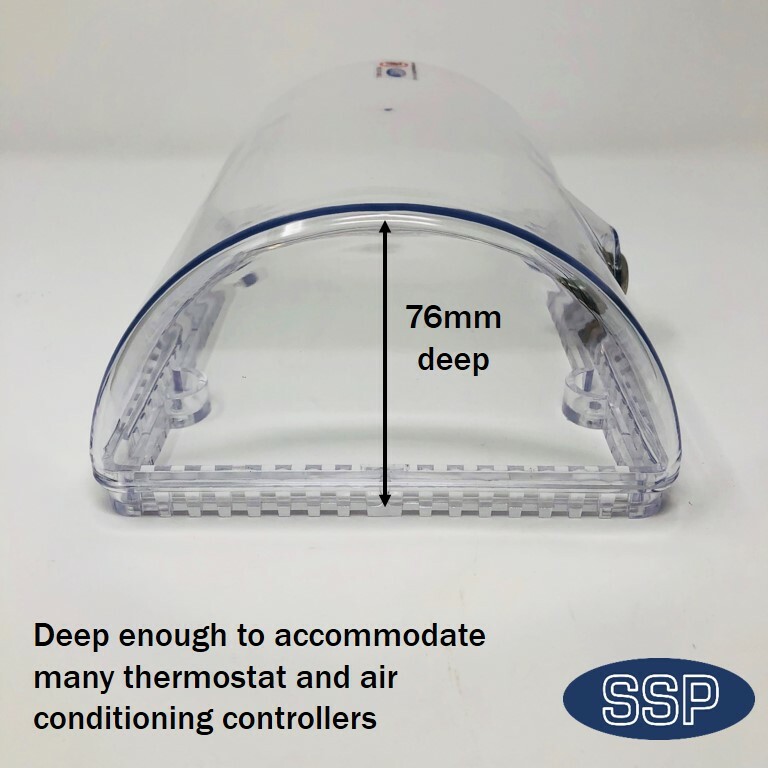 It is also used by some to hold remote controls for thermostat controllers, so the controller may be easily located but only used by those authorised to do so. The ThermoSTOP range of protective covers could be the best money most businesses will ever spend. In some cases their cost could be recovered through the energy bill savings they make in less than a month. Supplied with fixings, the covers are easy to install for either flush or surface mount applications. 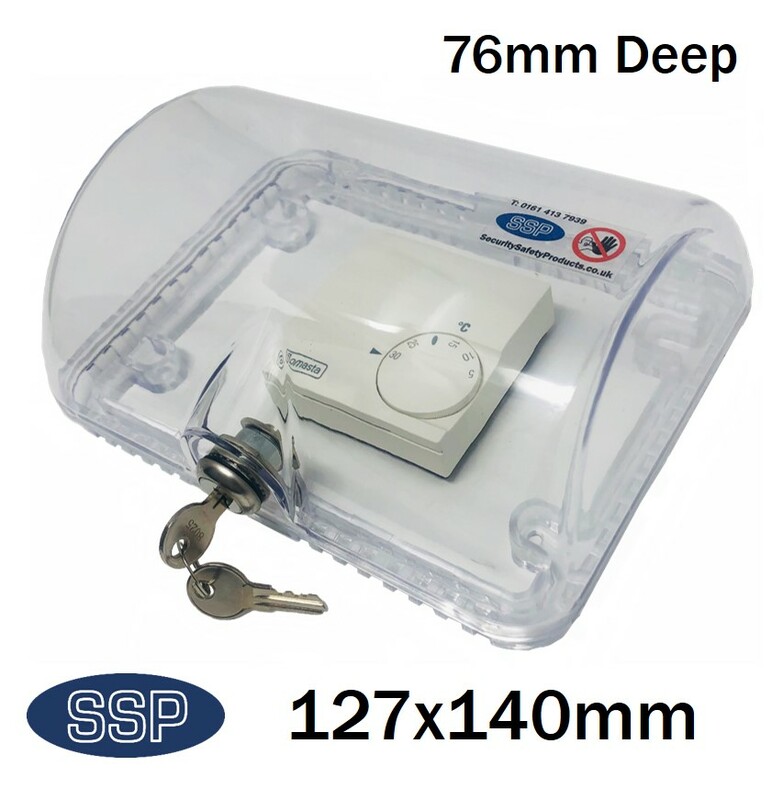 ".....being responsible for many tenanted buildings and having bought every type of thermostat protector sold by SecuritySafetyProducts, I am convinced that this product has saved my company many £1,000s over the years.."
"....I would say these covers probably pay for themselves in less than a month in the winter months.... "
2.What did you think of the product? Seem to be fine - time will tell how well they stand up to village hall users. I had to make a thermostat in our self catering house tamperproof- was able to drill 20mm hole to right hand side to allow finger in to spin temperature dial- bit fiddly, used wood bit and Stanley knife to finish, so far seems to be ok. Service was good, product is unobtrusive which was important, five stars all round as far as I am concerned. 5. Do you think that having the option to pay through PayPal would be useful? Paypal would benefit some. 1.What made you choose to buy these products from SSP? Found SSP via Google. 2. What did you think of the service? Very good. 3. What did you think of the product? Good. 4. We are currently re-developing our website, what improvements (if any) would you like to see? Clearer details on dimensions, shape and material. 5. Do you think that having the option to pay through PayPal would be useful? Yes. 1 although there are suppliers in northern ireland they didnt have the item in stock nor would they have or else it would have taken up to 2 months to get me one. 2 once i contacted yourselves i found the service very good. I was given answers to all the questions i had posed or contacted when the answer was found out. 3 the product is just what i needed. 4 i would rate the company 5. 5 with your knowledge of the products you supply you could make yourselves more known to the market in northern ireland and with your prompt despatch i believe you would gain customers who want what they want asap. Postage methods could be redefined also. 3. What did you think of the product? Haven’t used them yet but looks good quality and like it will do what we need it to. 5. Overall, how do you feel we could improve as a business? My only comment would be that perhaps you could improve your website. The products are quite crowded and small. Perhaps you could have larger pictures/type and a bit more white space which would make it easier to find what you are looking for. Otherwise everything was excellent. Thank you. 1. What made you choose to buy these products from SSP? – purchased previously and happy with the service/product in the past. 2. What did you think of the service? – great. Quick delivery, good prices – no complaints. 3. What did you think of the product? – no complaints. 5. Overall, how do you feel we could improve as a business? – can’t think of anything, however if we could have a credit account with yourselves, that would be ideal. 1. What did you think of the product? The product is good quality - pignose security screwdriver bits. 2. Out of 5 (with 5 being great) how would you rate us? 4/5 only because you didn’t have in stock the clear version. Service good, will use you in the future. Why SSP? We chose to buy from SSP because we’d bought from you before and you were efficient and well-priced. Service? Since I only ordered the signs the afternoon before they arrived, the delivery was unbelievably fast! Product? Good to deal with a reliable company, even though our order was only a very small one this time. Rating? Definitely 5 out of 5. What made you choose to buy these products from SSP? An excellent product that did what I wanted. Out of 5 (with 5 being great) how would you rate us? Dear Hayley, Thank you so much for your amazing service. The equipment arrived by courier as promised on Tuesday and I checked it out yesterday to ensure it will fit and it all looks fine. We are a disabled adaptation company and on occasion required products for customers with special needs we found your company’s web site very helpful to obtain some of the items. The service we received was very good. 2. What did you think of the product? Seems good - four covers just fitted and it was easy. Well designed. 5/5 - my order was the one which seemed to go missing and either you or your office called as they had noticed no tracking information had come back, and the package was re-sent. This is customer service unparalleled with most other firms with whom convincing them a package has not arrived turns into a very stressful experience for the customer! The product itself is exactly what I was after. I actually bought two covers. The lock on the medium cover was perfect. Tough, robust and almost impossible to break in to. If I was buying again I would recommend the medium over the small one (with its plastic lock) every time. Rating out of 5 - 5"
5 out of 5 - Excellent service and product. Very pleased with the service. Goods were delivered on time and invoice received via e-mail on the same day as the order was placed. Came through today and fitted beautifully! Thank you very much for your help! Good product, next day delivery. Website fairly friendly - found what I was wanting quite quickly. Many thanks for the prompt delivery of the security boxes. Ordering from the web site was simple and the material was received the next day. I would rate your company overall service as 5 out of 5. First class service First class product and web easy to use, will certainly use again. 3. What did you think of the product? Not yet used. 4. Was the website easy enough to use? Yes, a very good website. We were very happy with the product, the service the website 5 out of 5. I am grateful for landline link and talking to helpful staff. They are to be commended. The website was easy to use. Particular thanks to Katie Davies for her assistance in keeping me advised as to when the product was going to be delivered - which was very quickly! Would recommend SSP to others and certainly use again when required. So far so good i have had to return an item and am waiting a refund, if that goes to plan then great service as the replacement was delivered the next day just before Christmas. 1.Had seen these items before in another hall and could not remember the name of the product so searched the net and your SSP came up did some comparisons and chose yourselves. 2.The service was excellent what topped it was your returns system, I was able to exchanging the large for the medium with no hassle; well done. 3. 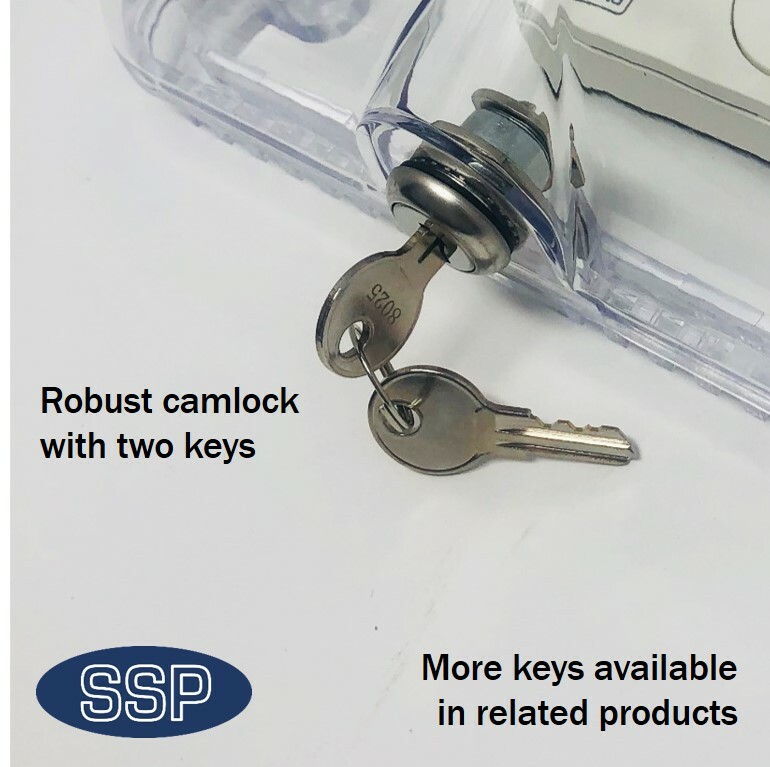 The product was very good well moulded and substantial thickness and having the same keys for both. 4 .Your rating in my opinion is 4.99, no disrespect nobody perfect. 3. Product as described. Yet to be fitted. 4. Was the website easy enough to use? No. Data not in a user friendly format and no pdf data sheet to download. 4. Was the website easy enough to use? The website was a piece of cake to use! Next day delivery, thought cost was a little high. 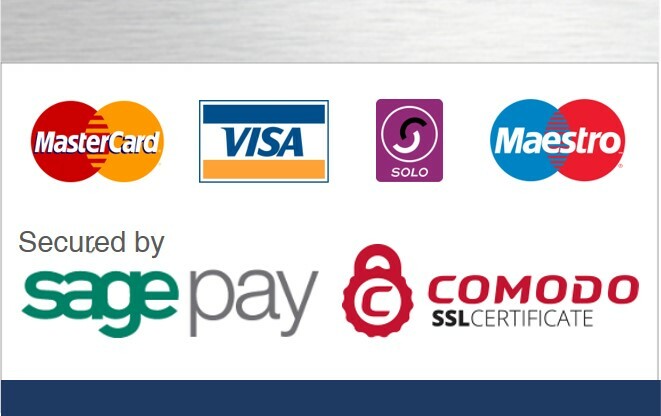 Pay pal would be another useful way to pay for those who use it. Very pleased with product, could do with a size between medium and large. 2. What did you think of the service? Excellent service, received a phone call stating 1 item was out of stock but would be dispatched in a couple of days. 4. Was the website easy enough to use? Yes, except it refused to take my card payment and I had to phone up. 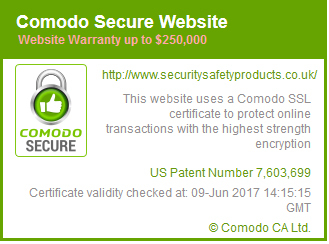 I want something with a really good lock on it? If you need something with a substantial lock, you would be best to order a medium or large thermostat cover. This comes with a conventional camlock. This is robust, reliable and very difficult to get into if you do not have the right key. The small thermostat cover unfortunately has a plastic lock that perhaps is not quite as secure. Is this thermostat cover compatible with Hive and Nest thermostat controllers? Yes, completely compatible. It is proven to not affect or restrict the performance of any Nest or Hive thermostats in any way. Not only is this cover entirely compatible, this particular size should also fit most models. Do I have to remove the controller before installing this locking cover? No. It is retrofittable. In plain English this means it will fit over the top of your controller or switch. 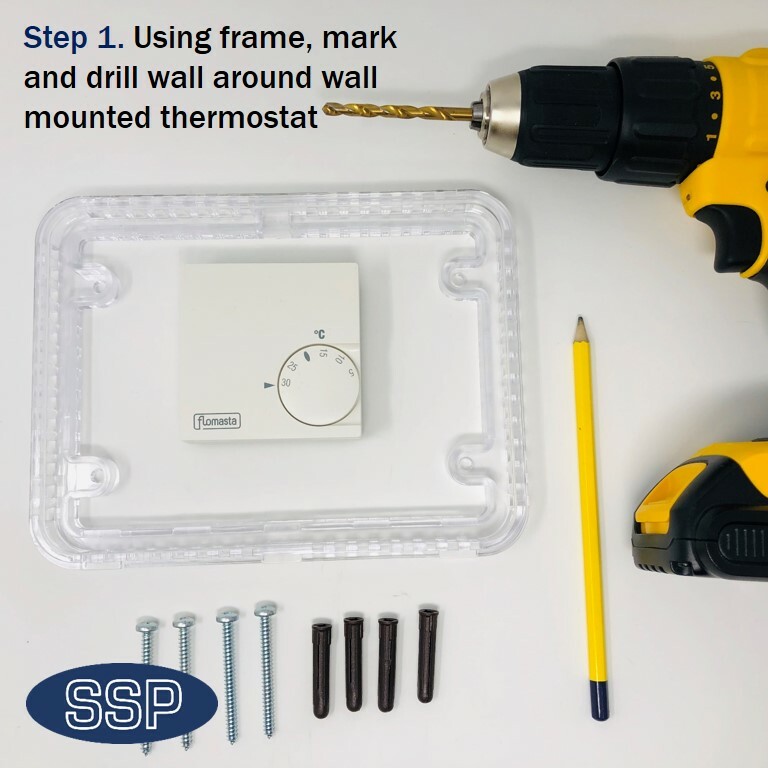 Simply drill four holes around the device, insert the RAWL plugs provided into the wall and screw the frame of the cover into place. The cover then hooks into this frame and is locked down into place. I have trunking/conduit going into my surface mounted thermostat controller? When I bought your cover it was slightly larger than I was expecting!? 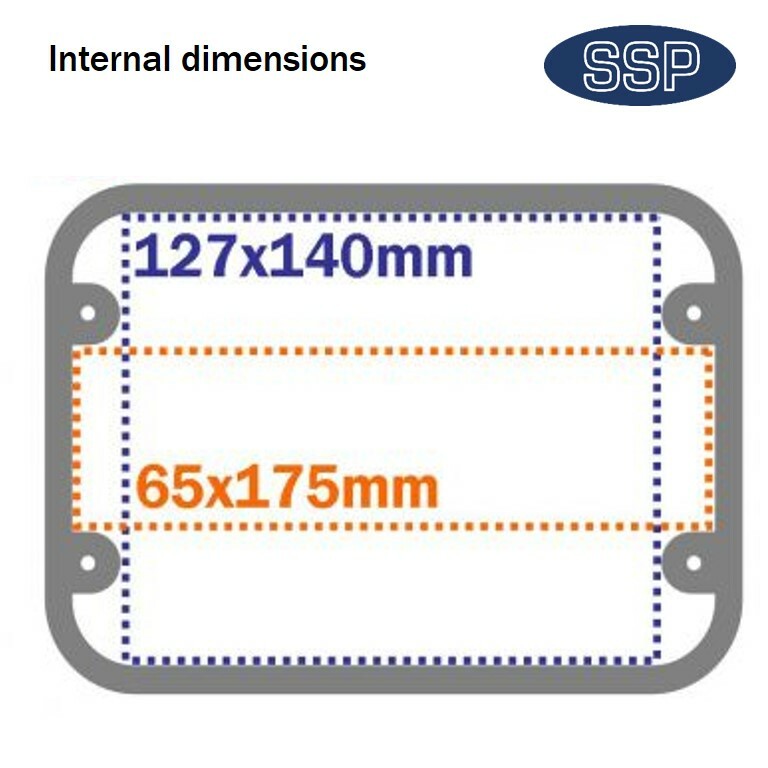 Be warned, the dimensions shown on our pictures are the internal dimensions. We do this to ensure that when you buy the cover it will fit over your controller. If you have limited wall space you should also read the external dimensions carefully, as shown in the write up above. Doesn'�t a thermostat need to sample the ambient temperature of the room in order to maintain the heat at a certain level? 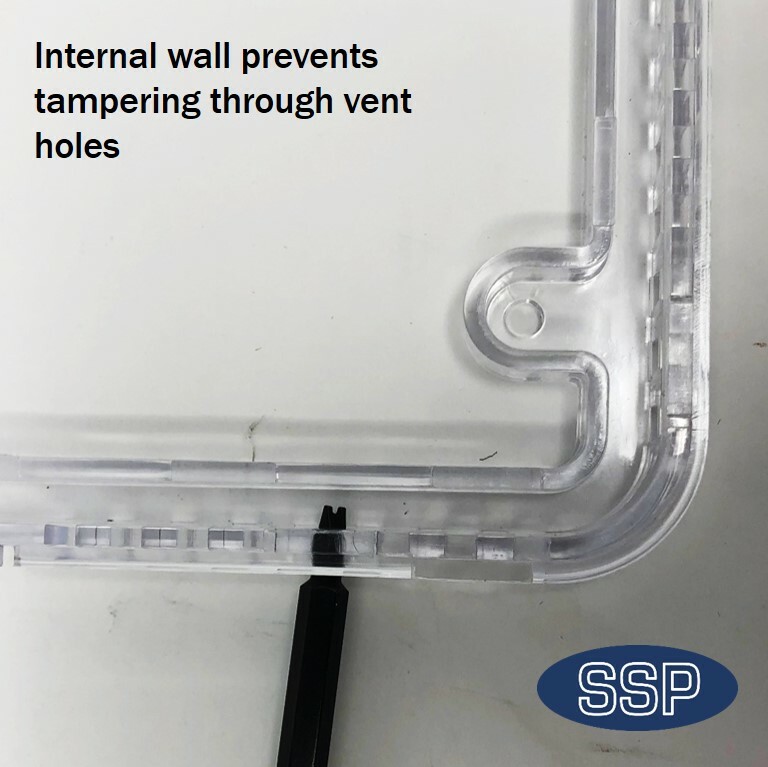 Absolutely '" which is why the ThermoSTOP cover has vent holes all the way around the outside of the cover. 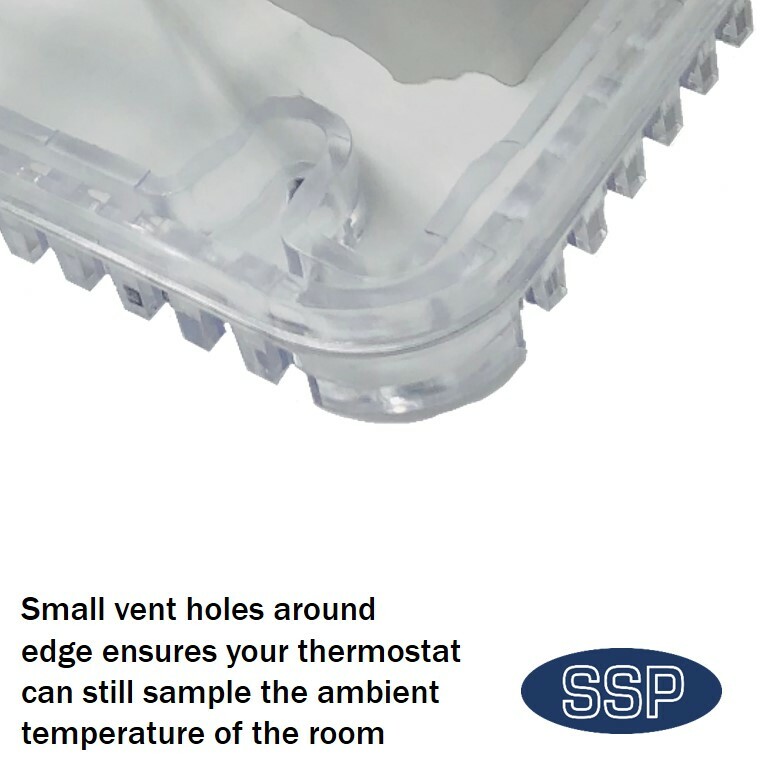 These vents holes are designed to be sufficient so they do not hinder the performance of the thermostat controller. However, they are also designed so objects cannot be poked through the cover to adjust the controller settings. Can I buy more keys? Yes - as long as we can find a record of you buying the cover from us in the first place we can provide you with more keys. However, please be prepared for a few questions as we are really keen to ensure the keys do not get into the wrong hands. If I buy 20 covers, will all 20 keys be different? No. These products are keyed alike for exactly this reason. We do not want, say, the school caretaker having to take all 20 keys around the building with him or her. One key will open all the covers. How easy is it to crack one of your cover? Far, far harder than you may imagine. For a start they are made of 3mm thick polycarbonate. Polycarbonate is used because it is shatter proof. The medium and large covers are also curved so an impact is dispersed across the entire surface of the cover. 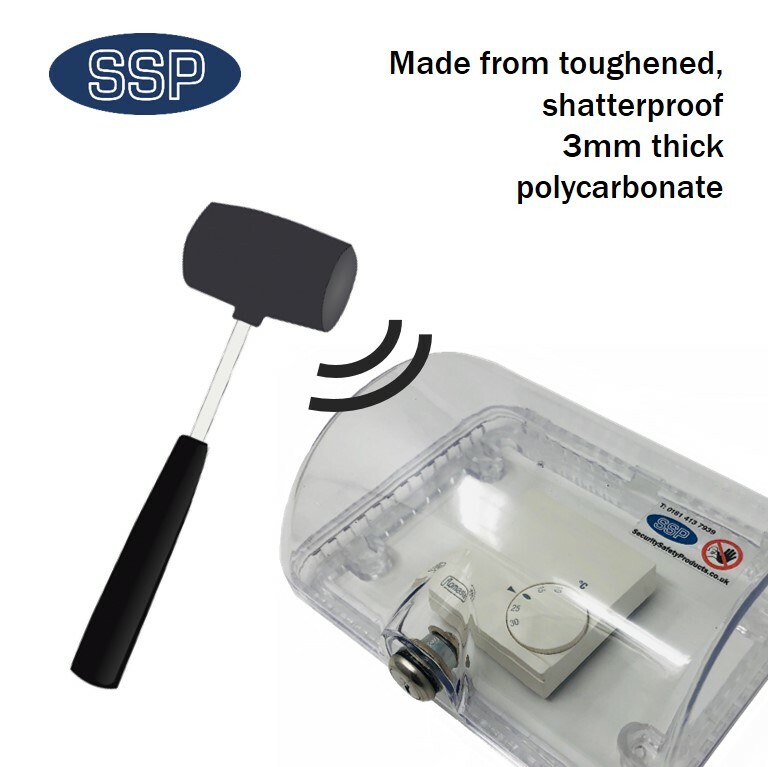 To give you an idea of strength, in all the years that SSP has been selling this product not once has it been damaged in transit by heavy handed couriers. I need my thermostat cover quickly? This is a mainline product for us. If we get your order before 3pm (and often as late as 3.30pm), Monday to Friday, we will dispatch this cover on a next day delivery, signed-for courier service. Just be aware this parcel will need to be signed for so you should choose your delivery address carefully.